Habitat: Upland moorland, crags and lakes; conifer forests on the slopes. Main interest: Upland nesting birds; coniferous forest birds. Regular/annual: Hen Harrier, Red Grouse, Wheatear, Siskin, Crossbill. Access: The Knockmealdown Mountains lie in the north-west of the county and can be reached by heading north from Lismore (the road by the petrol station, north of Lismore bridge). There is an An Oige youth hostel on this road at Glengarra or Cappoquin (go east out of the town and take the Mount Melleray road but do not turn right for Mt. Melleray further on; continue on north-east). If the eastern end of the Knockmealdowns are to be investigated, then it is best to take the Mt. Melleray road and head north beside the Glennafallia river up to Knocknafallia at 400 metres. The roads out of Lismore and Cappoquin meet near a bridge over a stream, where there are vigorous stands of Rhododendrons. From here to the Vee, on the Waterford-Tipperary border, the extensive forestry plantations and moorland on either side of the road are worth investigating for upland birds. There are many possible walks around the slopes, with the added advantage of the road nearby. 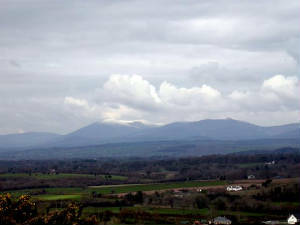 Knockmealdown, not far from the road and a safe walk, at just over 800 metres is the highest peak in Waterford, with excellent views from the top. For those capable of a long strenuous walk (5 hours or more), the journey across the Knockmealdowns, beginning at Knockmeal in the eastern end of the range, past the peaks at Knocknafallia, Knocknagnauv, Knockmealdown and ending at Sugarloaf Hill, just above the Vee road, is interesting and varied. On the Tipperary side of the border lies Bay Lough which has a narrow path leading down to it and is worth a visit.